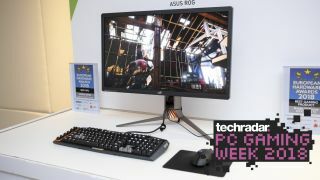 The first two Nvidia G-Sync HDR monitors, the Asus ROG Swift PG27UQ and Acer Predator X27, are bar none the best two looking gaming monitors currently on the market. But what is an Nvidia G-Sync HDR monitor anyway? Don’t think that Nvidia just found any old high-dynamic range (HDR) display, threw in a G-Sync module and called it a day. Nope, rather Nvidia’s Product Management Leader for Nvidia G-Sync Vijay Sharma tells us it took an extensive two years of product development working closely with both companies. We caught up with Sharma while we were in Tapei for Computex 2018, and he essentially broke down the product development cycle into three parts. First Nvidia works with panel manufacturers to come up with a product that has the right refresh rate, flicker properties, response time, visual quality and so on. Once a display panel is selected, Nvidia moves to display development with the OEM to actually build the display while it helps with panel tuning and on-screen display (OSD, or the menus you navigate on your monitor) development. In the final leg of product development, Nvidia gets the finished monitor in to put it through display certification tests to check for quality, performance, color, gamut and a properly working OSD. It’s only after the testing is fully complete and everything passes does Nvidia certify a monitor and stamp it with its G-Sync logo. Amazingly, this whole process is just what Nvidia does with all of its G-Sync monitors. “Our very first G-Sync display went through this process, and the 27-inch HDR displays came through that same process,” Sharma says. Of course, Nvidia G-Sync HDR takes almost everything about existing monitors and dials it up to 11. Sharma says Nvidia worked with its main display partner, AU Optronic, for multiple years, and its initial plans were to develop a 27-inch, 4K, HDR and 120Hz display that would take full advantage of Display1.4 refresh. After getting to the panel to overclock to 144Hz, Sharma recalls the next thing Nvidia wanted to tackle was its backlight structure and increasing the display’s overall brightness. At that time and arguably today, standard-definition monitors operate with 200-250 nits, some might get bright as 300 nits and 600 nits was a very high benchmark at the time. But Sharma’s team wanted to really step up the luminance, so they said 1,000 nits. “I think the fellows almost fell on the floor,” Sharma jokes. “It was a big jump and this hadn't been done before in a PC gaming monitor. When you're playing a game and something happens, an explosion or a light comes on or you look at the sun, you want a physiological response. I want to feel like this explosion just happened – that it's hot. Beyond the sheer power and brightness Sharma wanted to harness for his G-Synch HDR displays, he also wanted to improve the monitor’s overall backlight. With most SDR displays at the time they relied on a global backlight, which often employed a string of LED around the edge of the screen to create elliptical zones across the screen. Suffice it to say, elliptical backlights weren't going to cut it for Nvidia’s first G-Sync HDR screen, so Sharma’s team opted for a full-array direct backlight, which creates a matrix structure of LEDs all over the display. The next obvious question for the G-Sync HDR team was how many zones did they want? “At the time, there were televisions, which were obviously much bigger than 27 inch that had on the order of 30, 24 and maybe 56 zones,” Sharma explains. “So, you could imagine that if you had 32 zones on a 55 inch television, your zone is pretty big. The last piece of the puzzle for the first Nvidia G-Sync HDR monitors was to improve the panel’s color that plays a huge role in making an HDR display. Sharma explains that the DCI-P3 color gamut capture 25% more of the color spectrum than SRGB – this even even includes a portion of colors that occur in nature. To achieve this, the G-Synch HDR team and AUO employed an quantum dot film that essentially acts like a programmable color filter. This quantum dot layer essentially changes the shade of light by changing the diameter of its matrix even if the source the illumination is only a blue light. So, for example when the quantum dots measure seven nanometers across and you pump in a blue light, the only thing that comes out of this really narrow spectrum is a green light. Then, if you were to further widen the quantum dot structure, the light would turn red. Sharma explains that you get much more saturated colors than you would with a traditional bulb, which mixes together green, red and blue spectrums to evenly generate a white backlight. This means if you want to show a really bright blue, a traditional bulb would have to increase the amount of red and green, and in the process it desaturates the overall intensity of the blue color. Sharma says his team is only getting started, and Nvidia’s plan is to make G-Sync HDR a new standard for the company and PC gaming in general. “We're going to make sure that as we introduce more G-Sync HDR displays, they’ll meet the same high level of quality and performance that the first G-Sync HDR displays met and they'll improve over time,” Sharma says. “We're excited about it,” he tells us. “I think it's one of the bigger changes in displays in a long time. There's been a few milestones in the display world. The usual and obvious one is black and white to color – that was like huge. And, then LCDs came, so that was CRTs to LCDs, and flat screen that was a transition. And, then the move to HD, that was big. And, then the move to 4K was maybe not as big, but the move to HDR I think is very big in terms of step functions.